Today most people use smart phones, and these phones are capable of receiving standard email. However to receive standard emails on these phones you will need an email account and email address. However it is also possible to send emails to a mobile/cell phone number, and also to receive emails from a mobile phone. This is useful for sending emails to old style phones and to contacts that don’t have an email address or you don’t know it. Because all phones can send and receive SMS text messages the trick is to convert the email to an SMS text message and vice versa. This means that the email message is limited by the SMS text message length of 160 character. The message conversion is done via an Email to SMS gateway, which can be incorporated in the mobile carrier network (common in North America) or an external Gateway (Europe). You can use any email client, and any email service provider (Yahoo,Gmail etc) to send the email. In order to send email to the cell phone you simply create an email (text not HTML) with your normal email client (keep it under 160 characters), and send it to the phone’s email address as described above. Most email clients will default to HTML email. You can change to plain text emails as a global setting or on a per email basis (preferred). In Yahoo mail at the bottom of the email message form you can see two left facing arrows. Click these to switch to plain text. Sending Email Using Mobile Carrier Gateway. 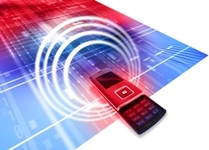 If the recipient’s carrier has a free gateway service then simply send it using the format. phone number+@+ carrier Gateway domain name. Note: don’t use country code or leading 0 for the phone number. 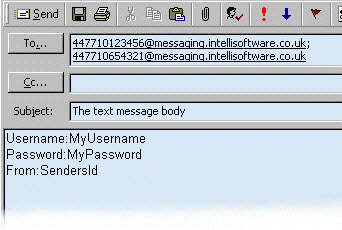 You can enter a message subject and also text in the message body. However just using the subject line helps keep the message small. The message the recipient receives will come from a number assigned by the carrier. 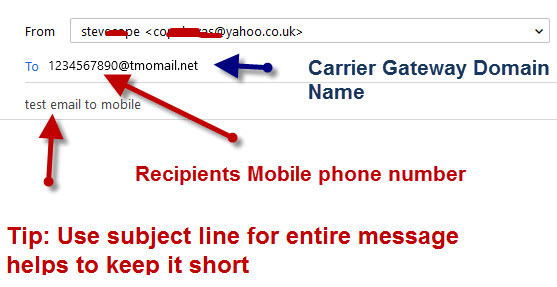 If the recipient replies to this number the reply should be routed to the sending email address by the carrier. When using a third party Gateway there are usually different ways of formatting the messages. This is because you also need to send login details with the message. Here is a copy of a screen shot for intelli-software showing my preferred format. I like this format as you can add the mobile phone numbers as contacts to your address book and even create message groups. Generally replies are sent to the email or SMS address you provide when sending the message . 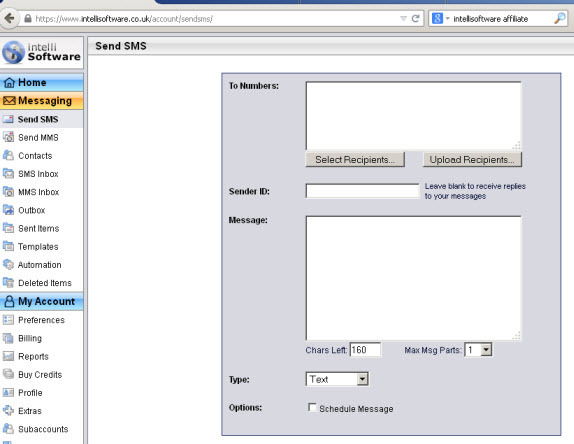 It is also possible with some carriers/gateways to send and receive SMS messages using a web browser. Using the Web interface is much easier than using an email client and you can have the replies sent either back to the web interface of another mobile number if you enter the sender ID. In addition almost all gateway providers support Android and Iphone Apps. Q- Do I get charged when sending an email using the recipients mobile gateway? A- No but if you use a third party gateway you do. Q- Can I send email to a smart phone using a Gateway? A- Yes. This you would do if you didn’t know their email address but you knew their mobile phone number. Q- How do I know what carrier they are using? Q- Can I send attachments? Sending Email to mobile phone using the phone number is done with a Email to SMS gateway. If you are sending to a North American Mobile phones then the Gateway is probably part of the carrier network, and free. Other countries vary, and in the UK it is easier to use a third party carrier. See this forum thread for more info on UK carriers, and this article has a list of Gateway addresses for North America carriers. This Makuseof article has a good list of gateway email addresses for most North American carriers and some International ones.